There was a time when a firewall was considered necessary only for Internet users with an always-on broadband connection. It was thought that dial up Internet users were connected for such short intervals that the odds of a hacker finding their connection was low. But today, hackers use automated software to continuously probe the Internet for vulnerable computers. Hackers want to know what operating system you're using, what browser you're using, and what virus protection you have installed. Most importantly, they want to know if your computer has any open ports they can use to take control of your computer. One of the hackers favorite tricks is to install spyware on your computer. Spyware secretly monitors your Internet activity, logs your keystrokes, accesses your email and other documents, and then uses your Internet connection to send this information back to the hacker. Your only clue to spyware activities is that your computer seems a bit slower than usual. Spyware can get on your computer through file sharing, instant messaging, clicking on a link in an email message, or just through normal use of your web browser. Once on your computer, spyware can install additional spyware on your computer without your knowledge. ZoneAlarm is a free (for individual and not-for-profit use), easy-to-use firewall that blocks hackers. 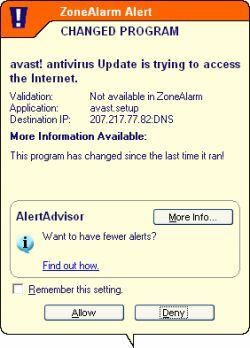 ZoneAlarm gives you a popup alert when someone tries to access your computer. Click on the [Deny] button in the popup alert - unless the program has legitimate need for access to your computer. At ZoneLabs website, you will be offered the opportunity to scan your computer for spyware before downloading ZoneAlarm. click on the link: "FREE! Scan My PC for Spyware Before Downloading ZoneAlarm", then click on the link "Scan My PC Now".